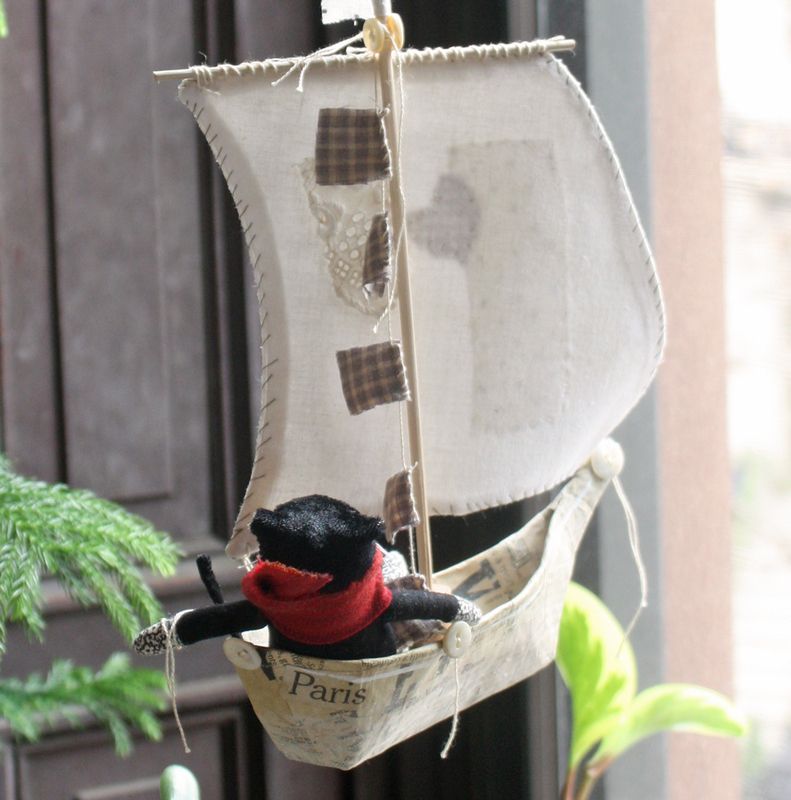 Socks is the kind of cat that does just what he wants so he is off to Paris for a holiday in his brand new ship. Woebegone pines, forlorn little trees who do not concern themselves with perfection. 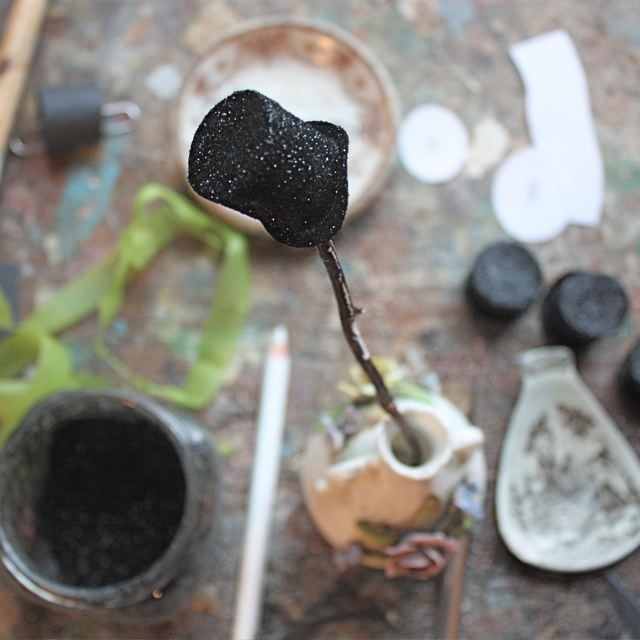 These trees are all about heart and the particular magic that something made by hand possesses. I’ve made you a sewing pattern with three sizes: small – 3 inches, medium – 4 inches, and large – 6 inches (the little guy is my favorite). 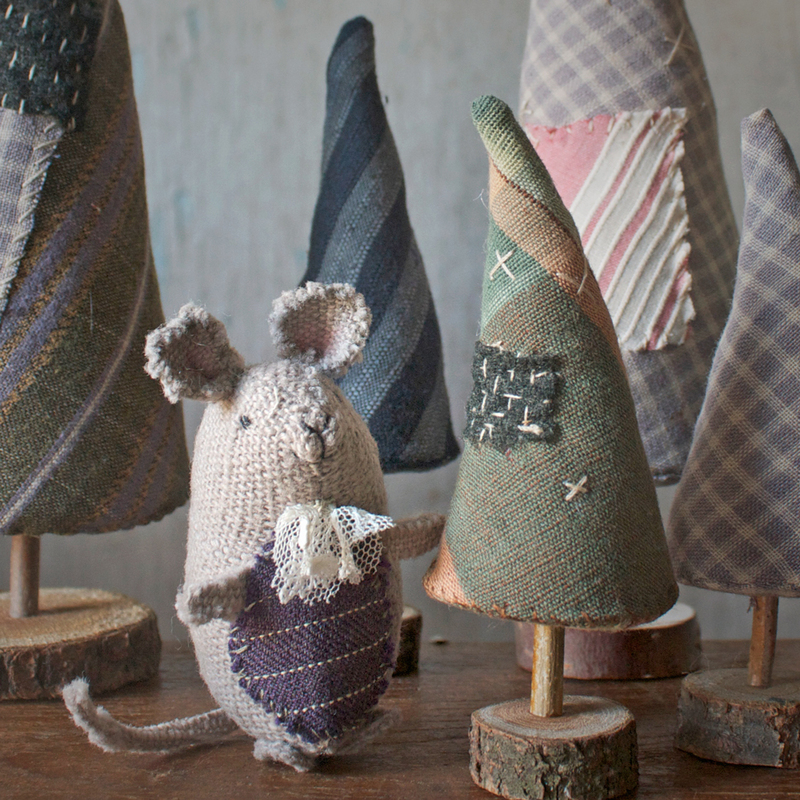 You can add a little trunk and base or just set them on their bottom. And Woebegone Pines sounds like a lovely place – doesn’t it? A perfect spot for a mouse to take a stroll and think his wistful thoughts. The seam allowance is 1/4 inch. 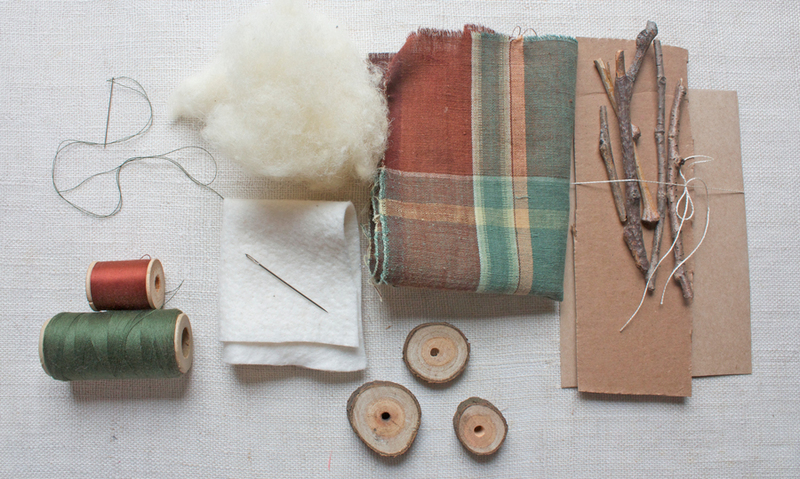 You could use a variety of fabrics – I’ve used cotton, linen. 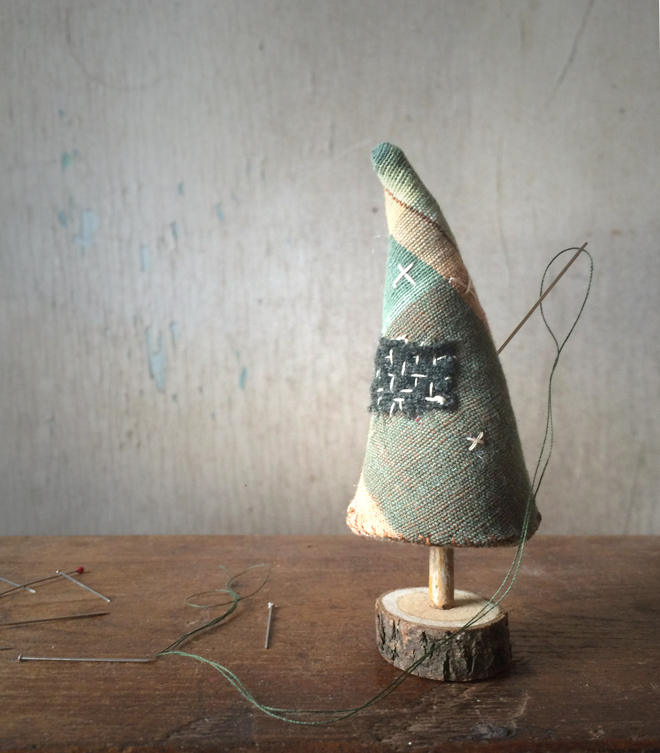 wool and felt – all worked well. 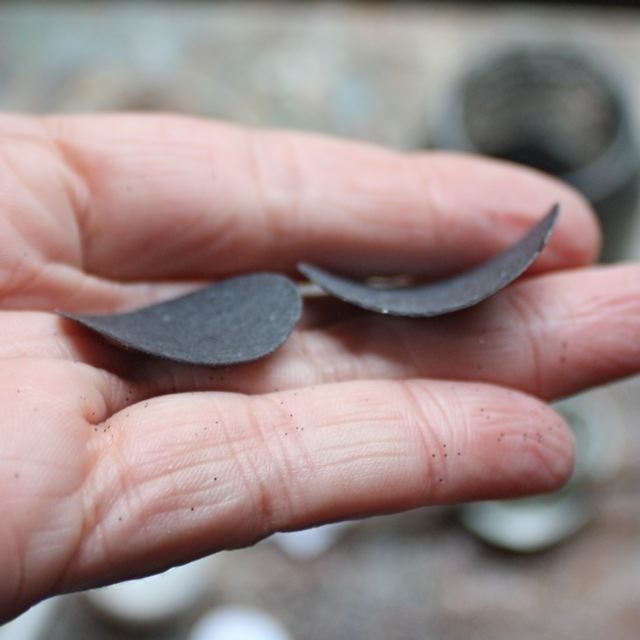 bases – I used little wood discs and drilled holes myself. You can purchase little bark slices like mine here – fyi if you purchase through this link I get a tiny commission so it works out all around. 1. 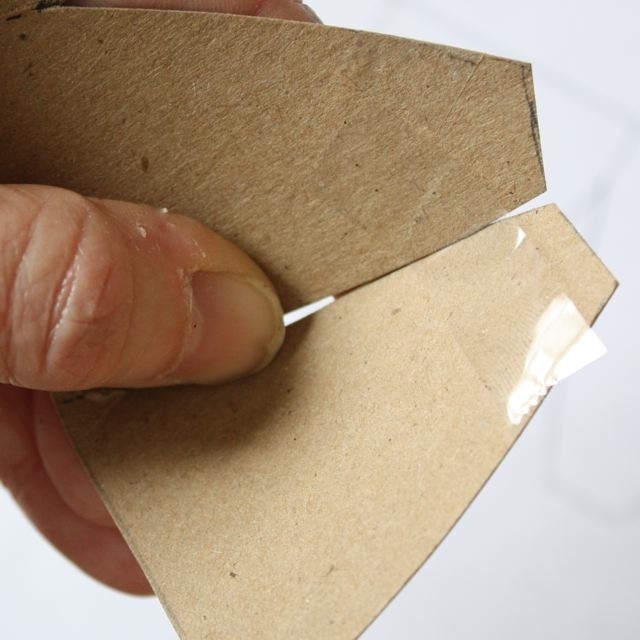 Cut out the cardboard base and one or two squares of corrugated cardboard – smaller than the circle. 2. If you plan to add a trunk to your tree glue one of the corrugated pieces to the center of the circle. ( If you are making the large tree glue two – one on top of the other). 3. 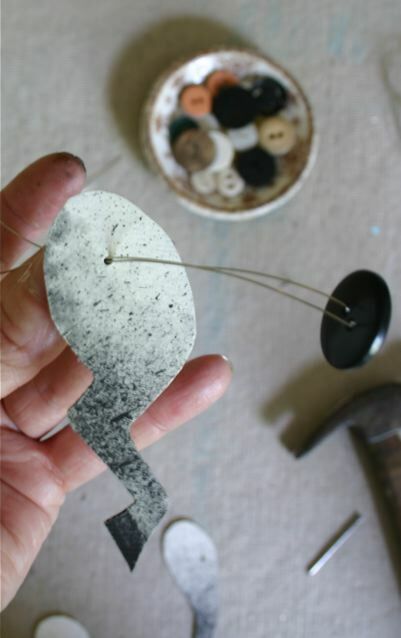 Use a glue stick to attach the circle to cotton batting and cut out. Let the glued cardboard dry completely. 4. 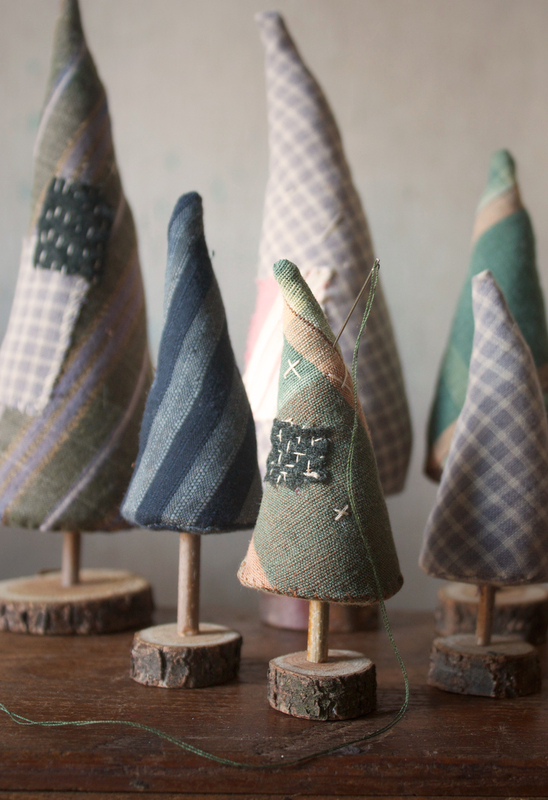 Pin the tree and tree bottom patterns to a single layer of fabric – cut out one of each. 5. 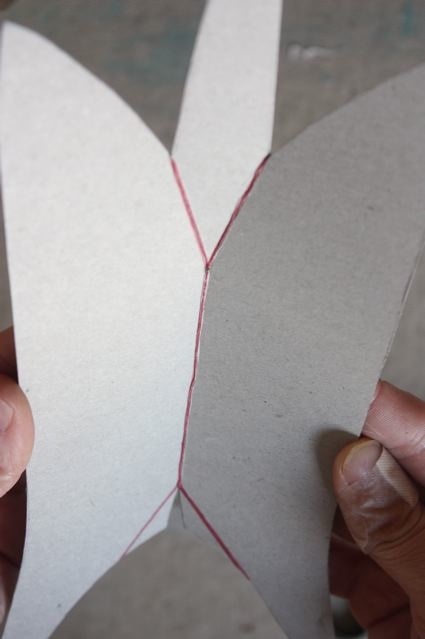 Fold the tree piece in half (right sides together) and mark the seam lines on the tree and circle. Stitch the seam – marked in red. 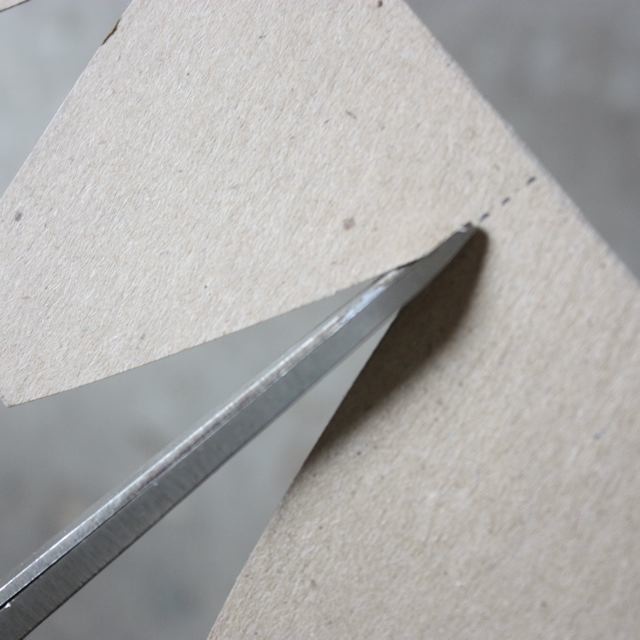 Leave the center of the seam open – about 1/3 of it – enough to fit the cardboard circle through later. 6. Snip the seam allowance at the top and bottom of the opening, fold over and press. 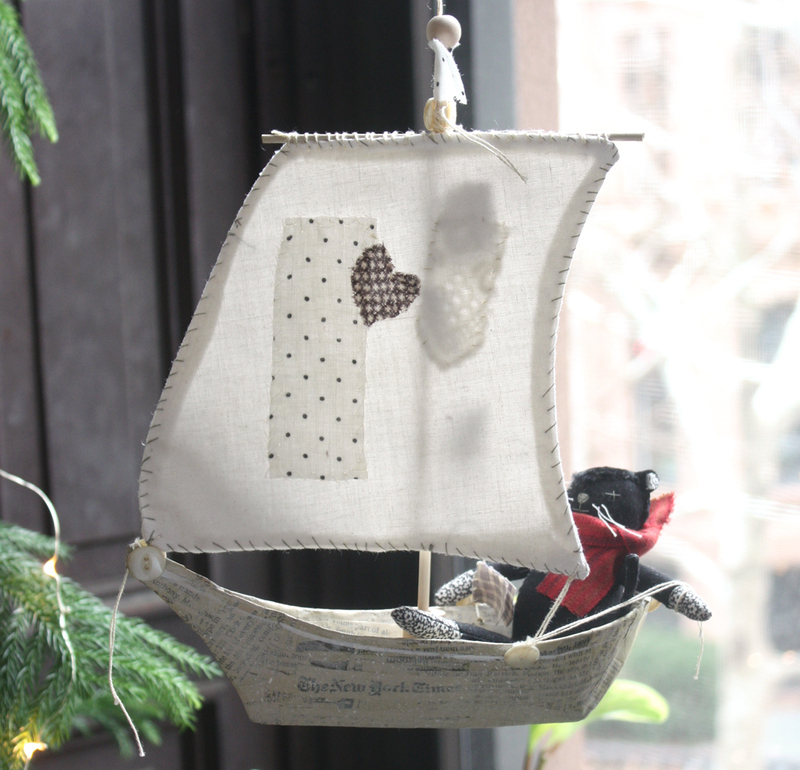 When I first started making ships I was doing little handkerchief rolled hems on the sails. They were pretty but drove me crazy and took forever. 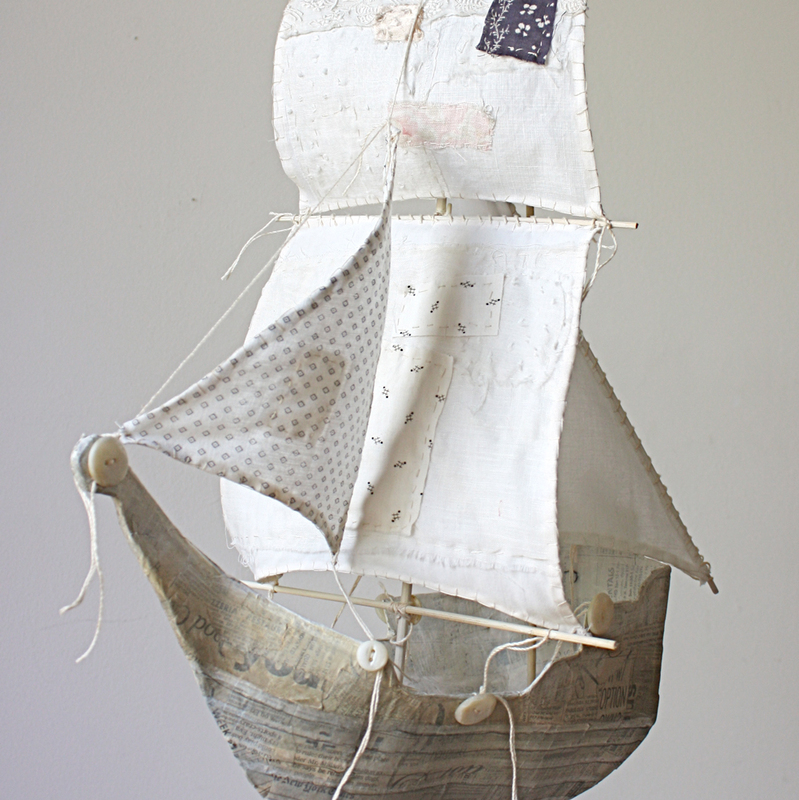 When I put together the paper mache ship pattern I wanted something easier and I found it. It’s super simple and has other benefits too. 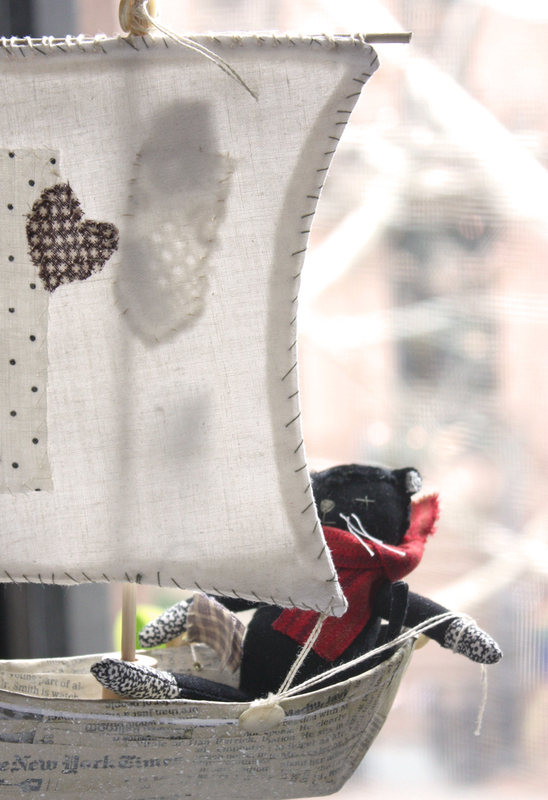 I cut two pieces of fabric for each sail (not usually the same fabric – I like the front and back to be different – even just subtly), pin them right sides together and stitch around – leaving one little section open. Trim the excess off the corners, turn it right side out, press and stitch closed. I add a whip or blanket stitch around the edge and layers of patches and lace. You can click here to download the sail pattern below if you’d like to give it a try. 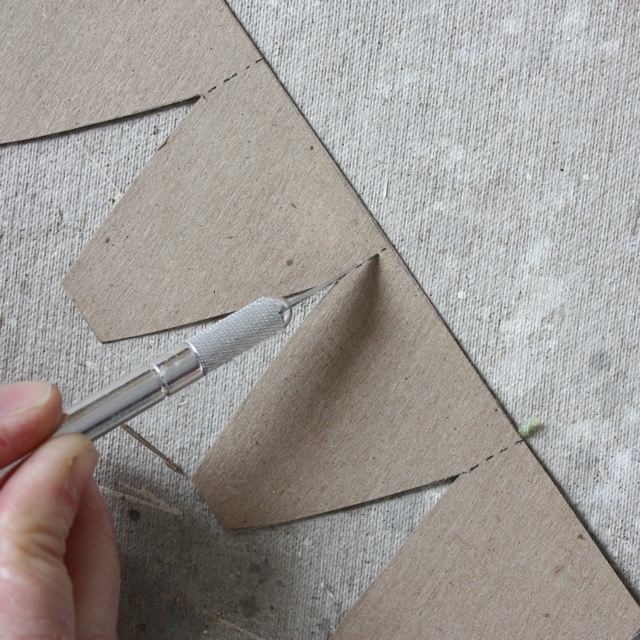 This method is much quicker than the tiny hems and makes a very tidy sail. Also the double fabric helps the sails hold their shape when you fill them with wind. 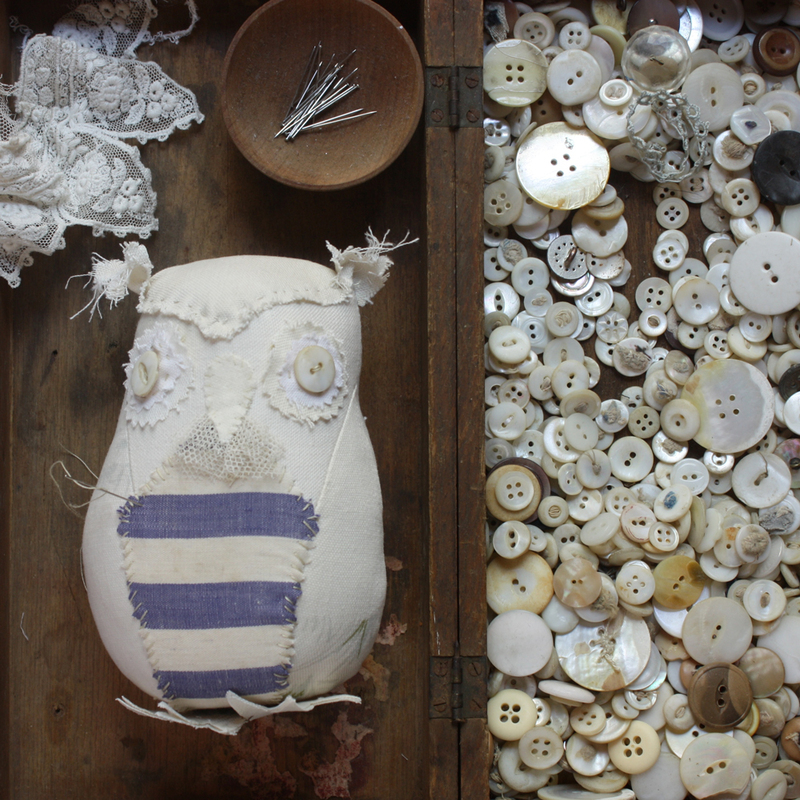 I’m making an owl to captain the ship I’m working on and used my favorite piece of antique ticking for his front. Putting a horizontal stripe on an owl transforms him instantly into a gentleman sailor. The owl below is the medium size from the little owl pattern. 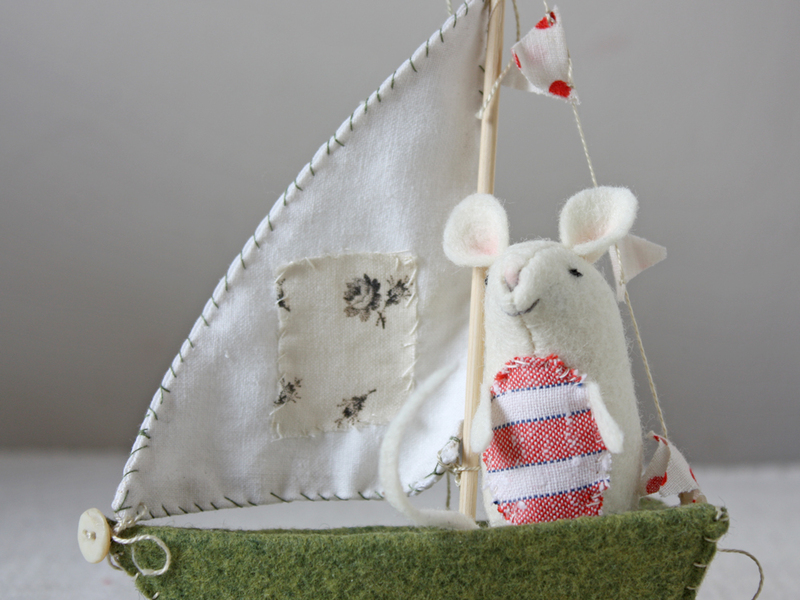 And ticking stripes are nice for sailing mice too. 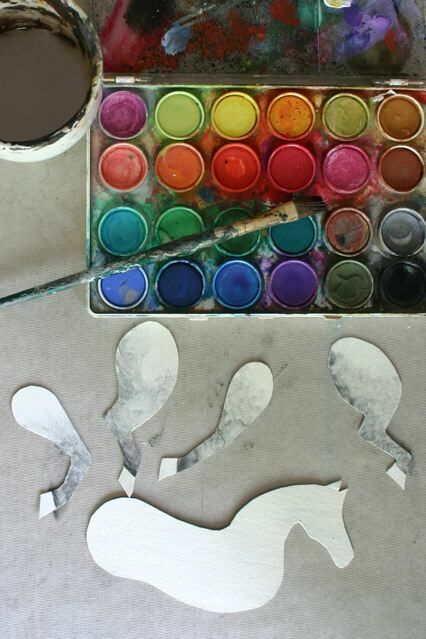 There are lots of cake topper birds on my worktable right now. It’s been 10 years since I made the first set and I guess-timate that I’ve made more than two thousand pairs. That’s a lot of dressed up birds. Today I’m going to show you how to make my frothy little gown for a cake topper bird or any other formal bird occasion. The bird is made from my little bird sewing pattern but I think you could use the same technique on other birds – just adjust the size of the lace. I think it’s helpful to read through all the steps before beginning and you can click the images for a larger view. 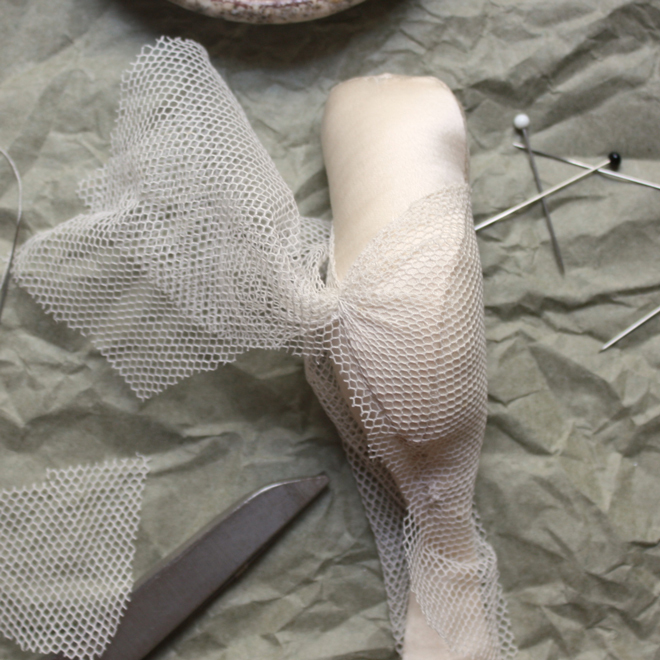 You will need a basic sewing kit and some lace scraps – something soft and not to stiff or heavy is best – I’m using cotton tulle. 1. 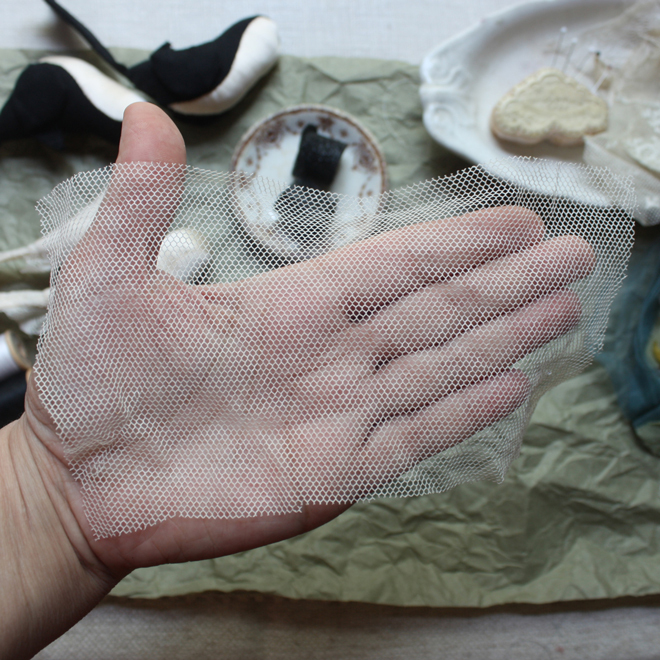 Cut a piece of lace or tulle – a rectangle that is 7 and 1/2 inches by 3 and 1/2 inches. 2. 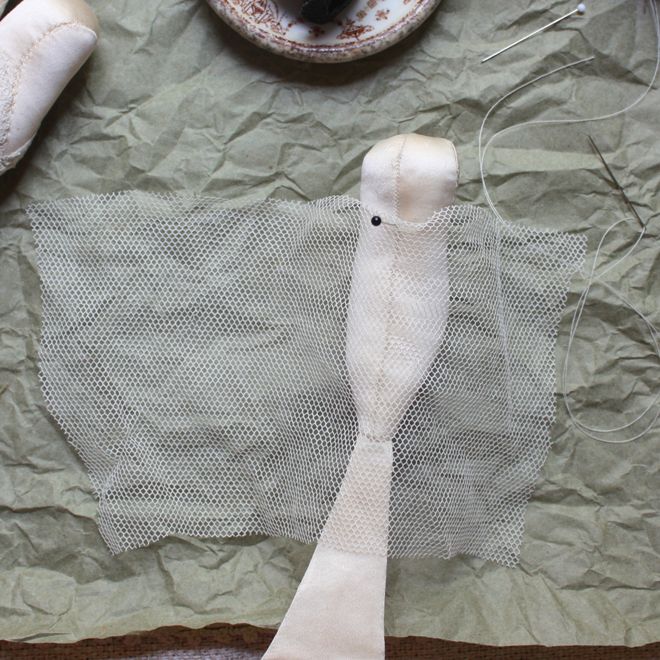 Place the lace on the bird so there is a long and a short side – you want one third on one side and two thirds on the other. 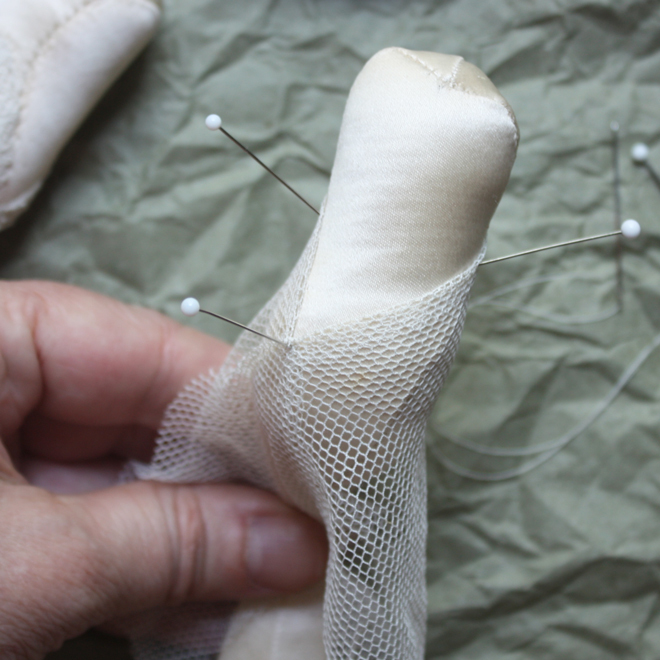 Fold the raw edge under and pin the lace to the back seam of the bird neck. 3. 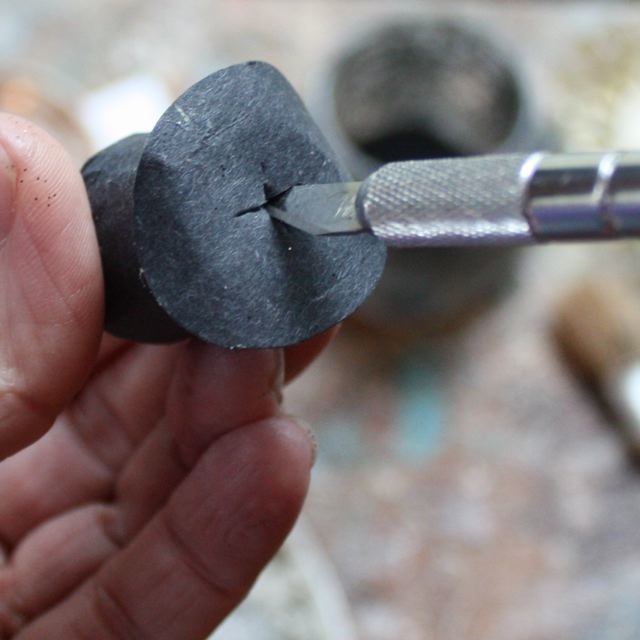 Starting with the short side turn the raw edge under and pin into the seam at the side of the neck and then again – right on the seam – about half way down the from of the bird body. 4. 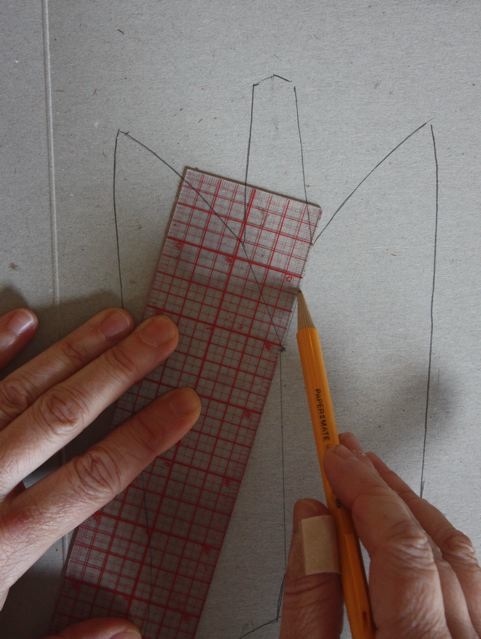 Repeat on the longer side – pin once at the neck and then bring the lace across the body – folding the raw edge under and meeting the pin on the other side – use that pin to hold both sides in place. 5. 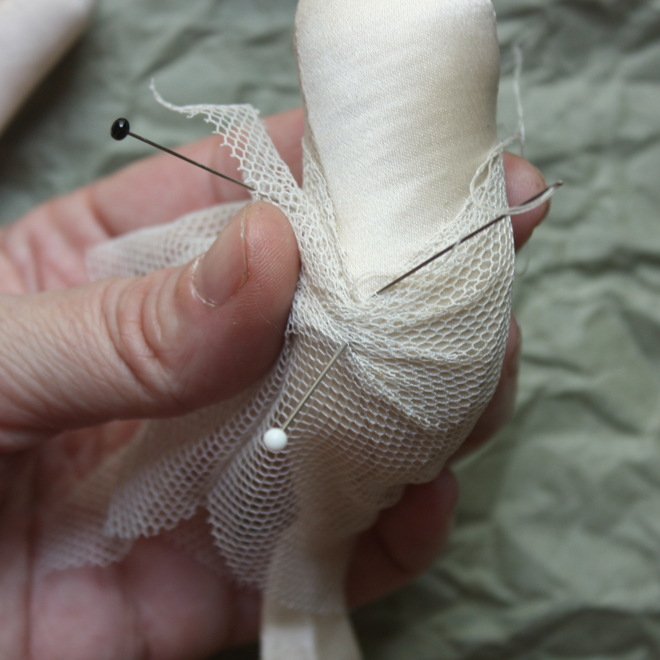 Begin stitching the gown to the body where the sides meet – make a couple tiny stitches here and knot once – keep the thread attached. 6. Using tiny whip stitches stitch all the way around the neck twice. It’s important to go around twice to make sure the neckline stays in place. 7. 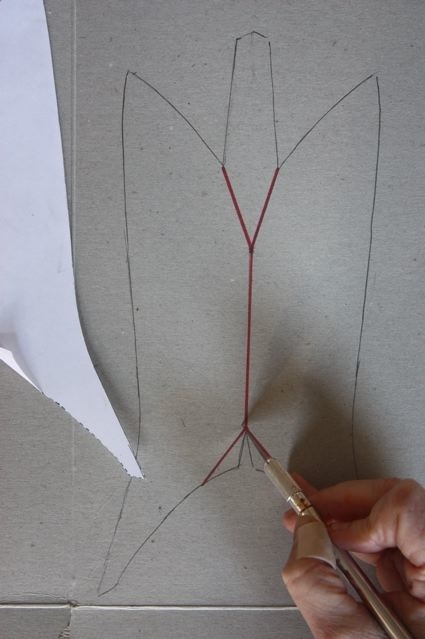 Pin the short side of the lace back out of your way and pull the long side around the body. To make the fancy ruched front gather the top 3/4 of an inch or so with your fingers into little folds – pin in place with one or two pins and sew the folds in place along the seam ( these stitches won’t show). 8. 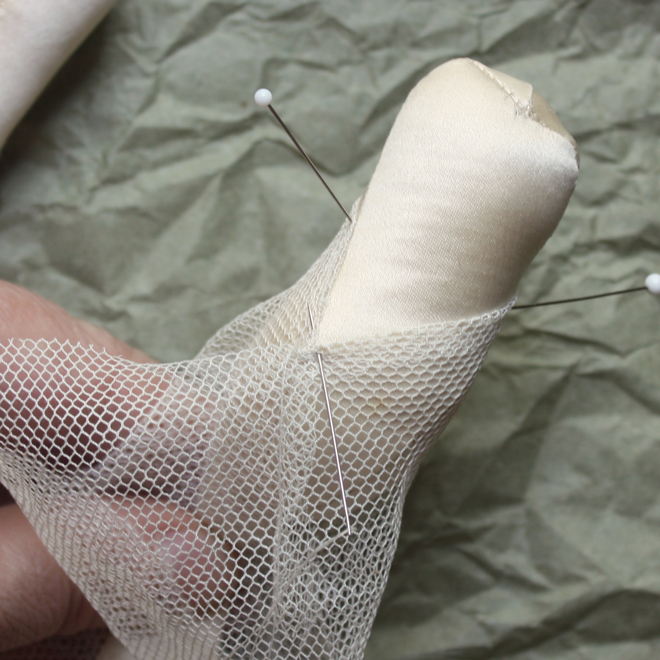 Use your finger to pull the long side of the lace around the body ( you may need to take out the pin holding the short side) and stitch the rest of the lace to the seam, stitching towards the tail – again these stitches will not show. 9. 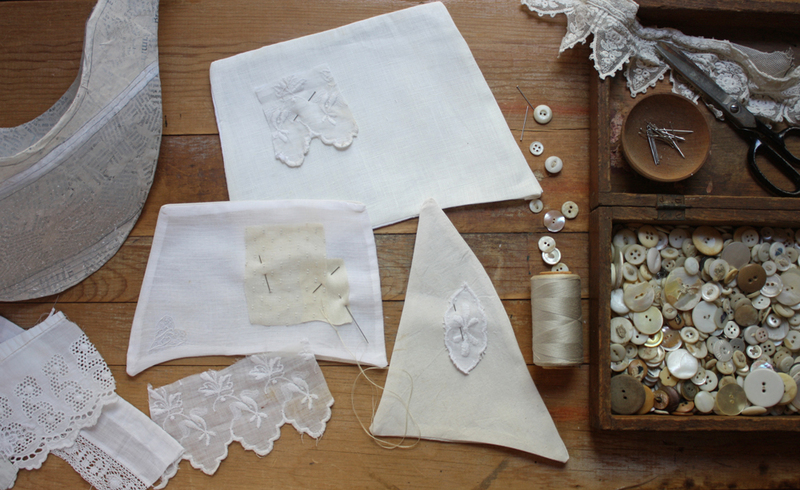 Stop stitching where the body meets the tail and trim the lace – just leaving a small edge. Stop trimming about one half inch below top (where the little folds are) and leave a long piece of lace. (save your little scraps – we’ll use them later). 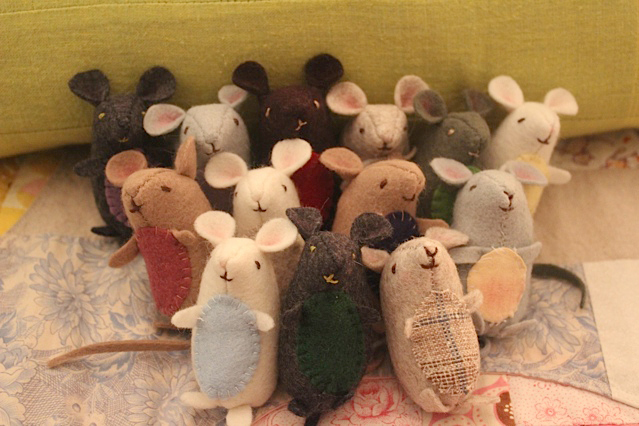 So many nice mice! 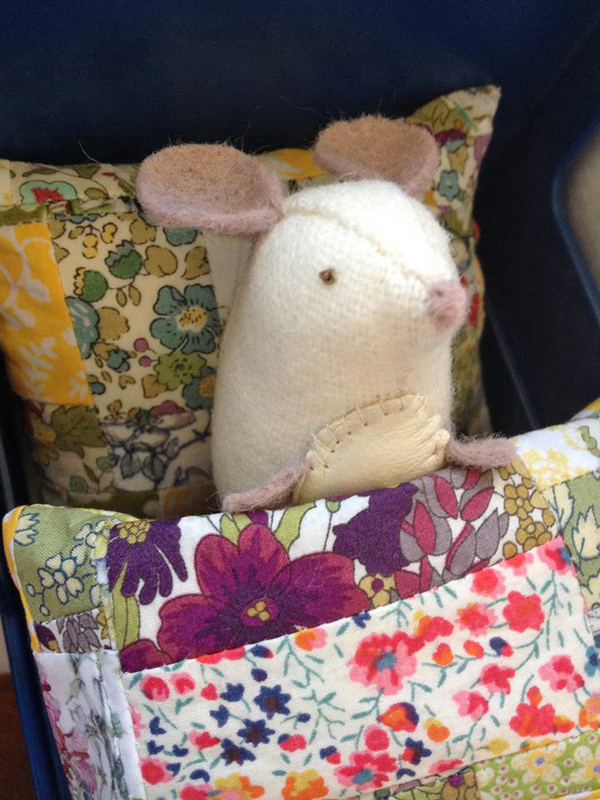 Thanks so much to everybody who made mice from my pattern and shared their photos – on instagram and Facebook etc. as well as emailing me – I can’t tell you how helpful it is and how much I enjoy it – a nice way to end the year. I love seeing what you make. 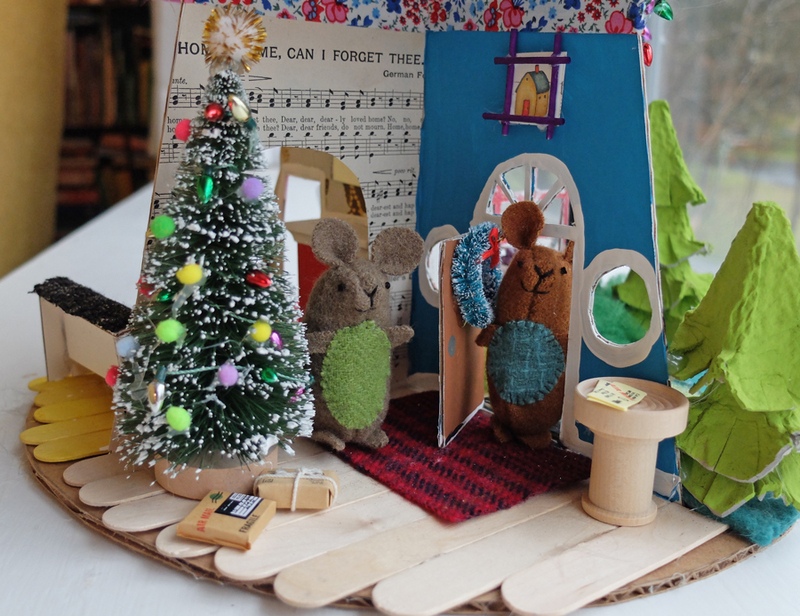 Check out the fantastic mouses and houses!! by readers below – I love them – every little detail. 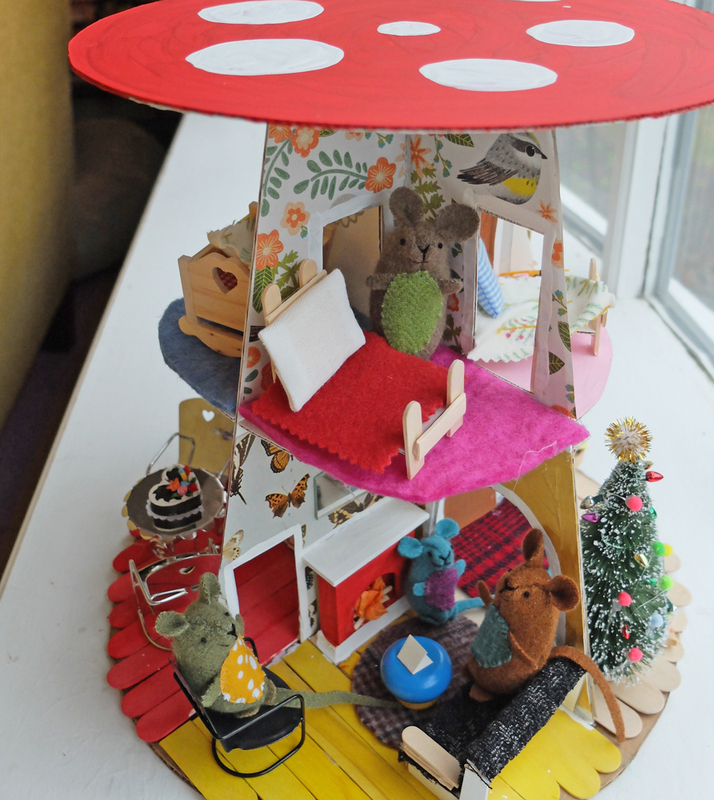 This multi level affair is by Maura for her son – I can’t stop looking at it. 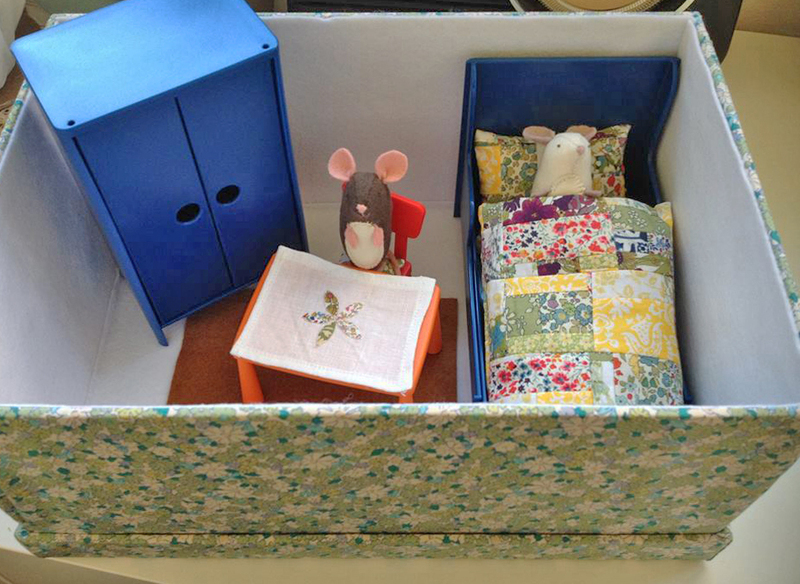 And A little house in a box by Mama with a Needle and Thread for her little girl – so freakin sweet. 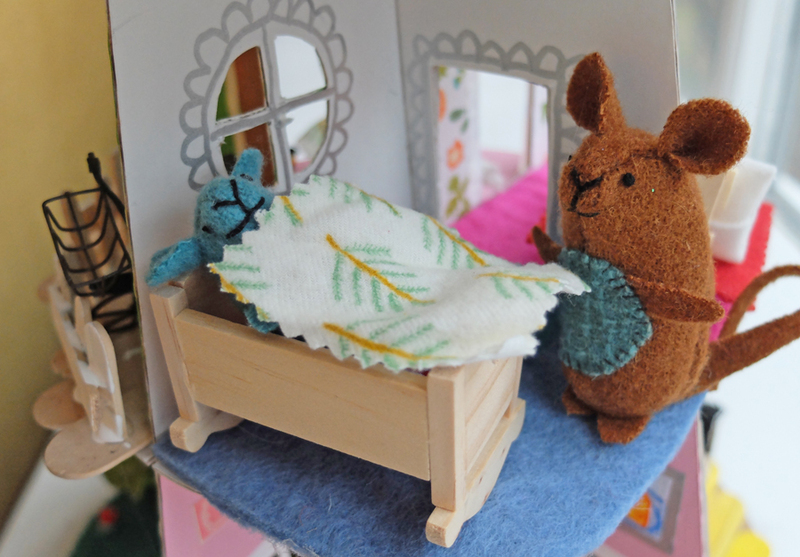 Good night little mouse! 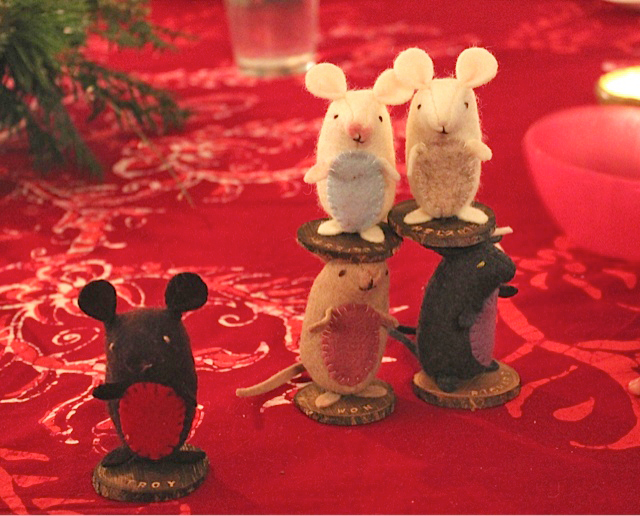 Susan added little wooden bases to her dinner place card mice – it’s such a happy crew. 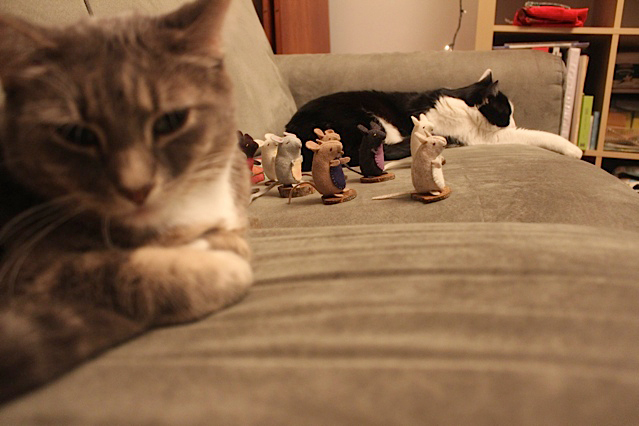 They survived a perilous journey across the couch – stay in a group little mice, stay in a group! 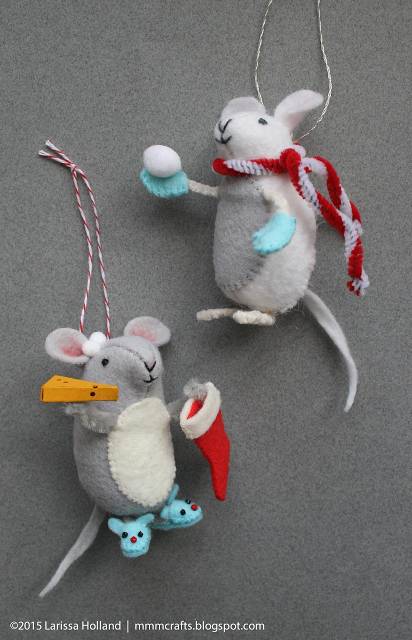 And finally from Larissa – mmmcrafts – slippers, mittens and snowballs – I love it. I’ve made you something! 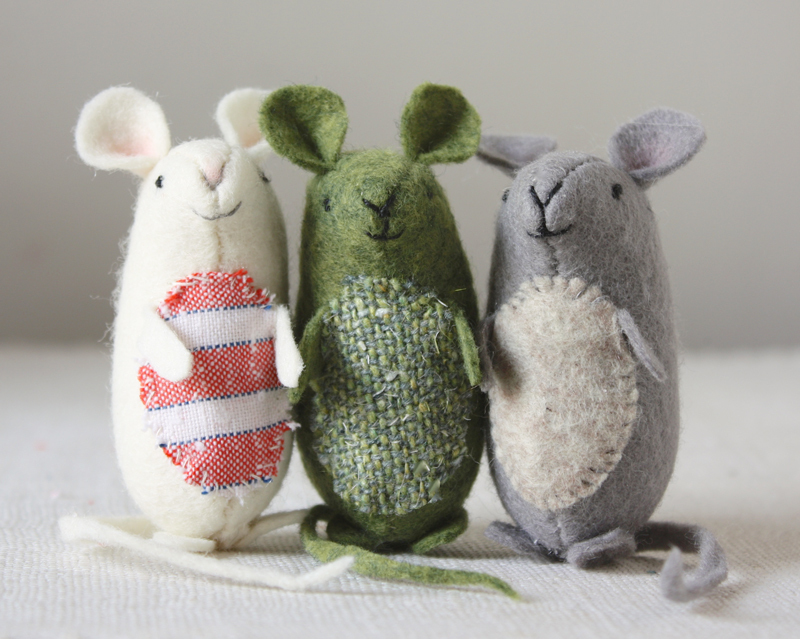 A free sewing pattern for some very nice mice. You can download the pattern here and all the instructions are below. So little – just 3 inches tall. They are quick and very easy. 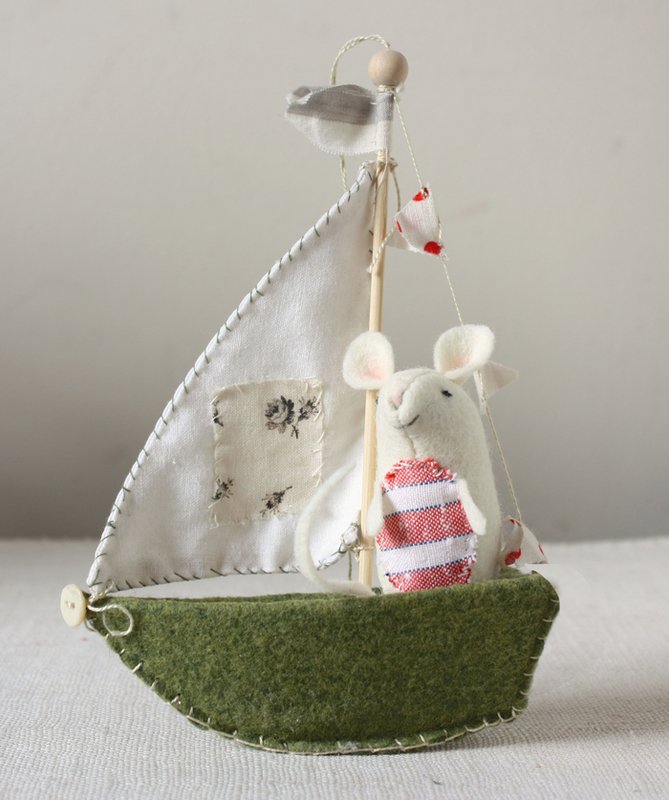 And they love to go boating – they are the perfect size to captain my little felt boats. I designed this pattern specifically for hand sewing and felt. The seam allowance of 1/8 inch is included. 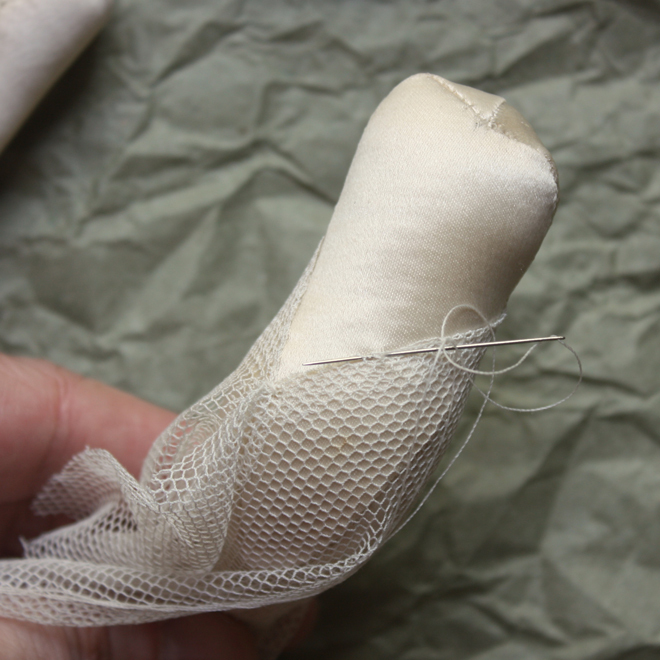 I recommend small, tight, straight stitches with cotton thread. 1. Cut one back and two side pieces from felt. 2. Mark both side pattern pieces with the guide dots on the pattern. 3. 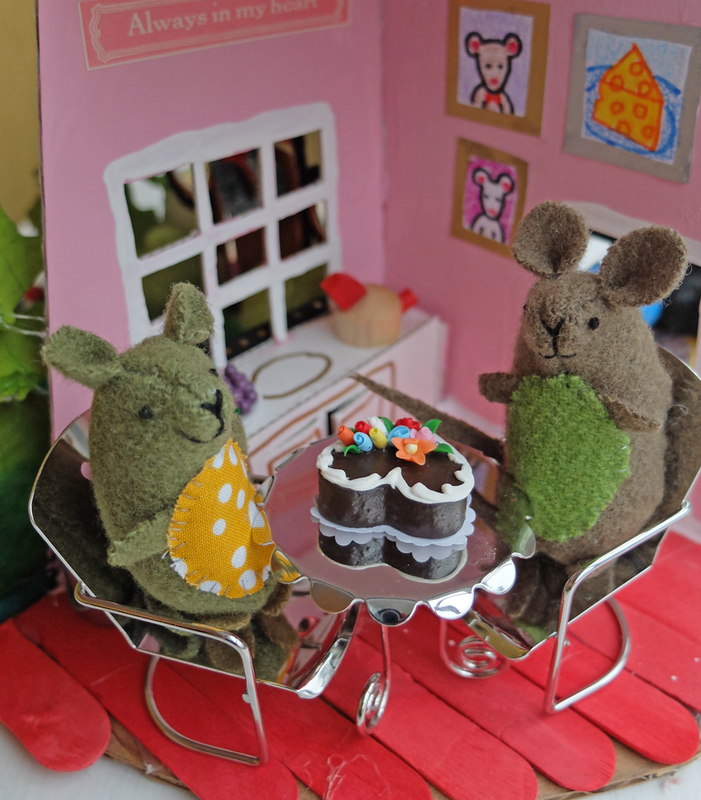 Cut out the small pieces – I used a lighter scrap of felt for the tummy oval (textured wool or cotton is nice too). 4. Stitch the side pieces together from the tip of the nose to the bottom guide mark – your stitches should be an 1/8th of an inch from the edge of the felt. 5. Optional – use a colored pencil to add a little pink to the ears. 6. Open the side pieces you sewed together. 7. Place the top of the back piece (the narrow end) in the center, matching the top edges. Insert the needle 1/8th of an inch from the top coming out on one side of the center seam (the side you intend to sew first). 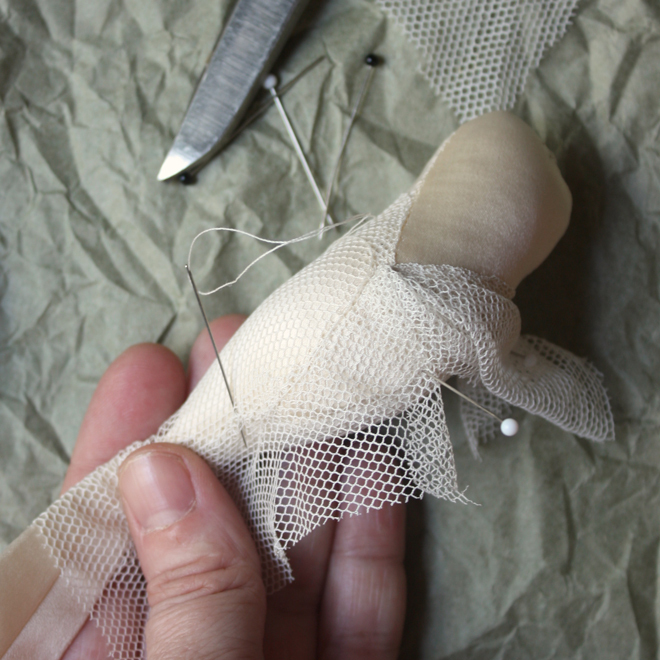 Make one tiny stitch and knot tightly. 8. Turn the back piece to one side and begin to match the edges and sew the seam-following the curve and maintaining an even 1/8 inch seam allowance. 9. Stop sewing and knot your thread just before the pattern guide dot on the side piece – leave there needle and thread attached. 10. Fold the bottom of an ear together – with the pink inside. I think if you want to make progress, find your best work and ideas, you must be willing to start where you are – as awkward or small as that might be. 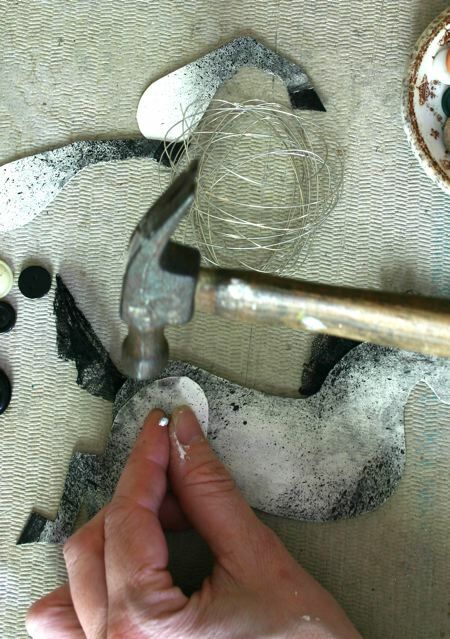 I’m usually very willing to do that – it’s one of my main life skills (the other is that I am insanely persistent, relentless even, the cool hand luke of art and craft). As soon as I started to compile the patterns I’m working on I realized that video instruction would be helpful – there’s nothing like a demonstration and it helps with language barriers on tricky steps. I have no video making knowledge or equipment beyond my semi broken iphone and a part of a tripod I found in the trash but I put something together with stuff I had around that’s working well enough and I wanted to show you in case you’re in need of a similar solution. I used a table lamp clamp I got at a yardsale, a wood clothespin and 2 file clips. 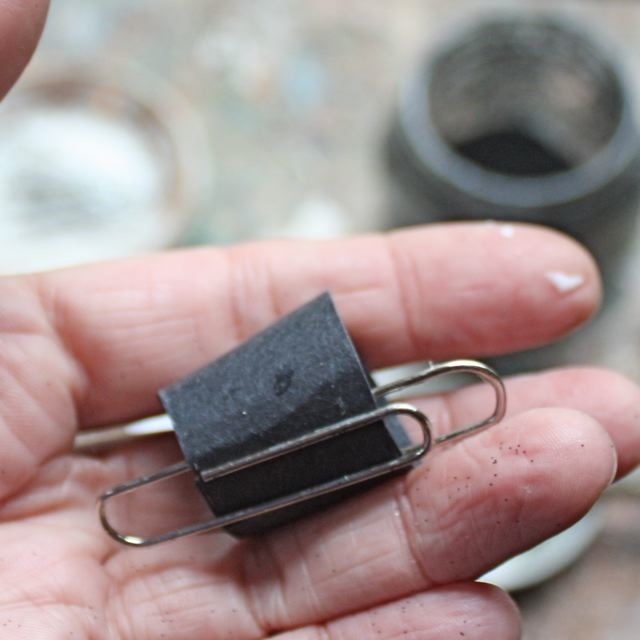 The clips slide in and out of the clothespin easily and I can position it in a bunch of useful ways – it’s getting the job done. I’m looking forward to getting better but having fun being a mess and experimenting. The whole pattern making experience has put me into that curious and driven kind of place that I was in when I began 7 years ago. 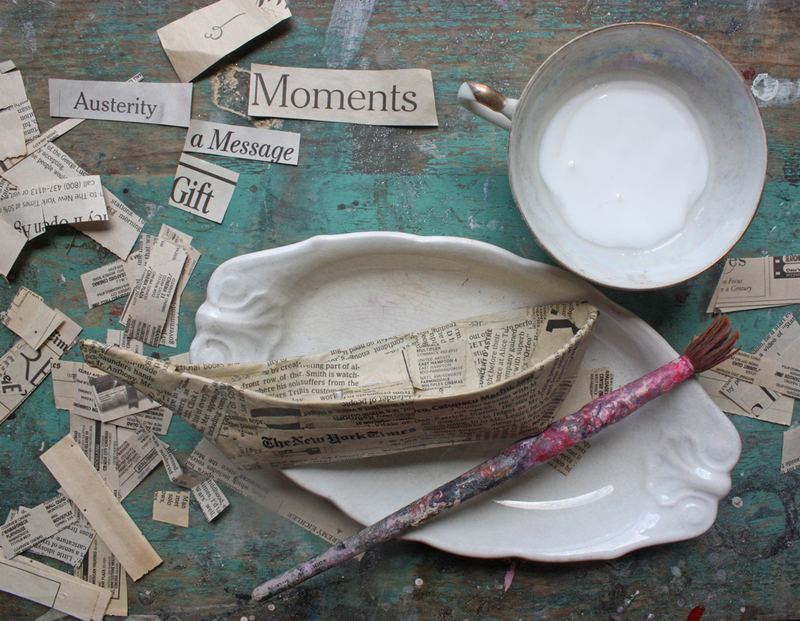 Today I was taking stills ( I don’t use the phone for that) and making videos for the next pattern – paper mache ships and boats (start saving your cereal boxes). I’m hoping to finish the photography tomorrow morning, test the rough draft this week, put it all together over the holiday weekend and have it available just after that. 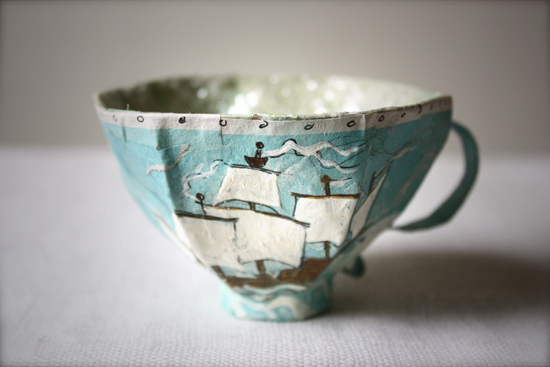 The ships and boats are a very satisfying project to make and I’m excited about sharing it. Thanks so much to everybody who has purchased the bird pattern. I’m putting a post together of birds made by y’all and if you’d like to be included you can send a photo to me at: ann at ann wood handmade dot com (please put bird photo in the subject). I keep adding things to the bird pattern. Last week I decided it needs videos so last weekend I shot how to sew the body, ( it’s the trickiest part) you’ll get a link to that with the pattern download. And today I shot “how to make a perfect bird leg”. It’s one of the things I’m most often asked about, the little bird legs, so I thought I would share that now as a gift. It’s my first ever video! It should be below – if not click here. I hope you make bird legs! And stay tuned for the little bird pattern – it’s almost there. 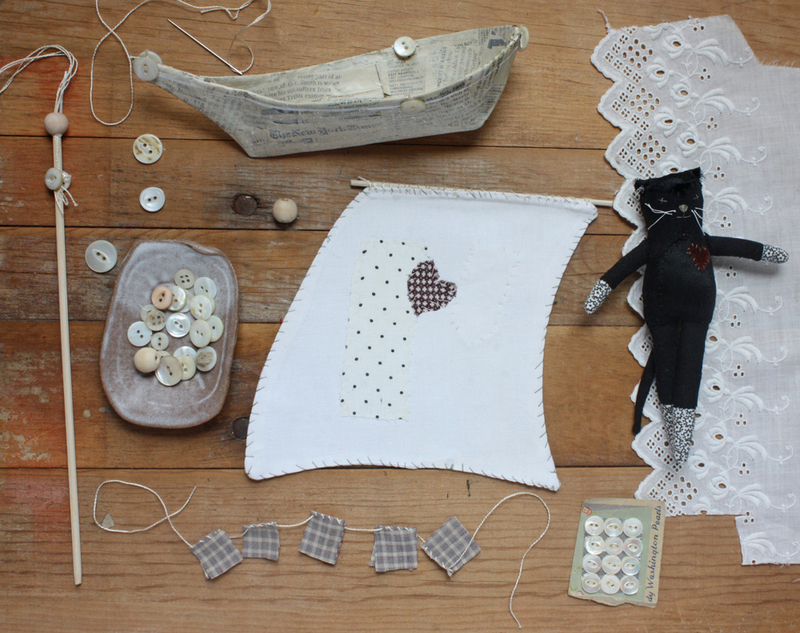 If you’d like email updates about new patterns and workshops etc. you can subscribe here. Be sure to check the “make something” box on the signup form. 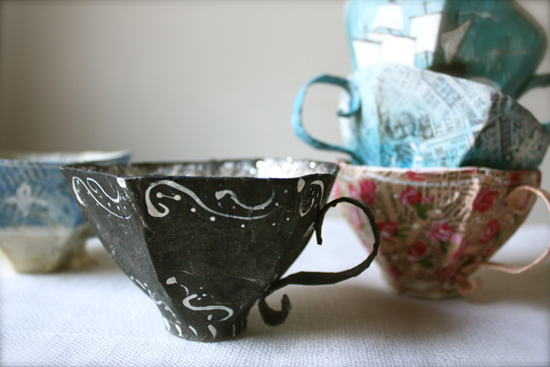 A paper mache teacup pattern to mark the 5 year anniversary of my blog, my experiment. A perfect time to say thank you and give you a present. There is a template you can download here. And lots and lots of photos and instructions. If you do make teacups I’d love to see and you can upload a photo here if you like or leave a link to your photo in the comment section below. pencil, scissors, exacto knife, and paint and brushes, glitter, fabric – whatever you’d like for decoration. Click the photos for larger images. 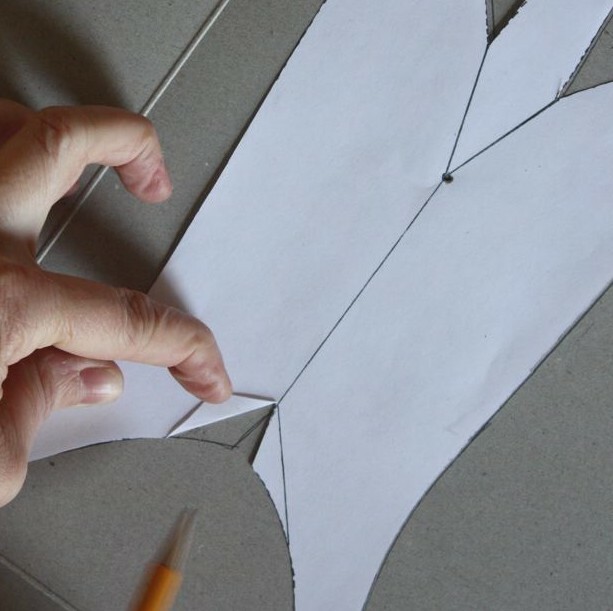 Cut out the templates for the teacup, handle and bottom and trace them onto your cardboard. I had the best results with a Kashi frozen pizza box. 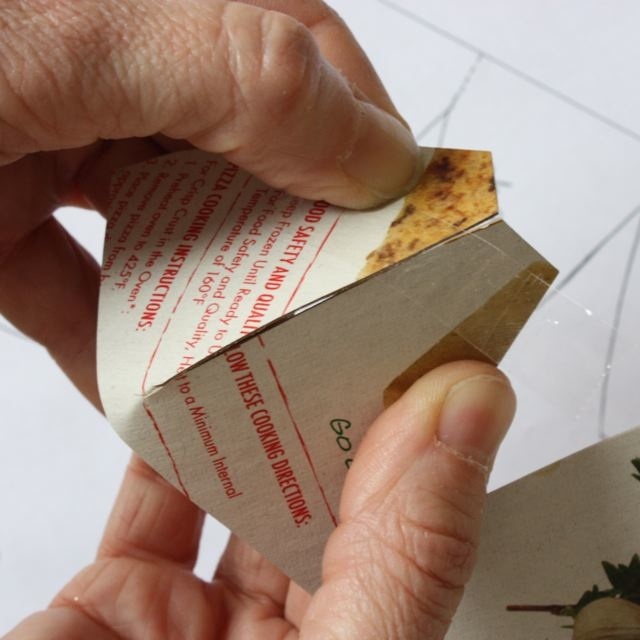 Cut out your pieces and very lightly and gently score the the teacup where the dotted lines are on the template with the BACK of your exacto knife. 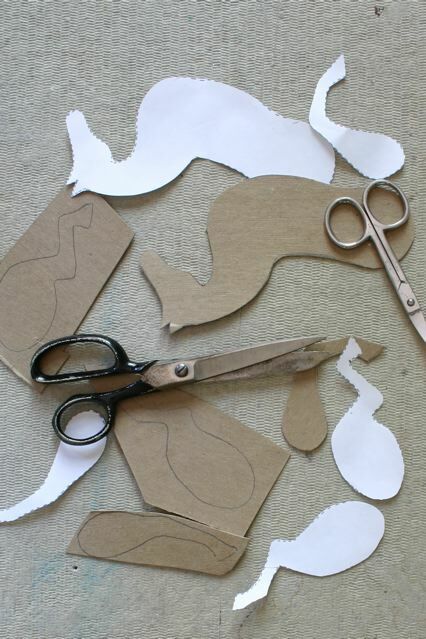 Make a very tiny snip – really tiny -just a 16th of an inch or so where the sections meet. Next bring the bottom sections together one at a time and tape together on the outside (the printed side). Then turn it over and taper the bottom inside. Do this for each section – always taping both sides……. 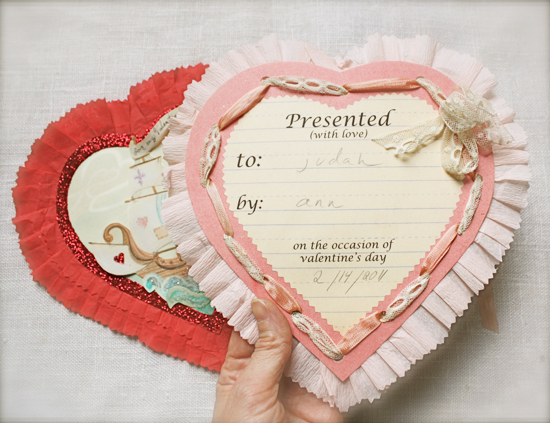 A fancy valentine, for you to print and make and give. Download a zip file here with images and some instructions. Just print the images on card stock and follow my instructions or come up with your own stuff. Happy Valentine’s Day! And if you make one I’d love to see – you can share a photo here. I made the ship above as a prop for a TV commercial a couple years ago. I assembled some boxes and parts of boxes into a shipish shape and then added all sorts of stuff – pipe cleaners, dixie cups, part of a birthday crown, wooden ice cream spoons, buttons, felt, etc. etc. The castle collage below was for an ad as well. I think they would be fun for little people to make ( with some grown up help). 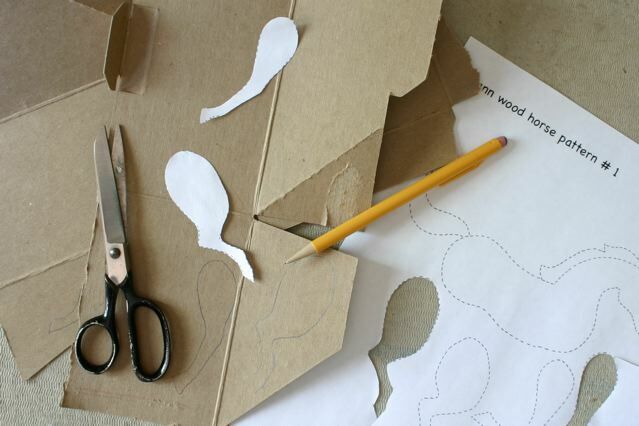 Both involve using the die cut sections of boxes for details . I can’t resist a good piece of cardboard – I live near a fancy grocery and their recycling is full cartons and boxes with interesting cutouts and shapes. And instructions. Epic instructions. They just go on and on. I hope to add more concise printer friendly instructions later but my Christmas brain just isn’t capable of it. We are making Mediterranean inspired little sail boats with lateen rigging – a single triangular sail on a relatively short mast. 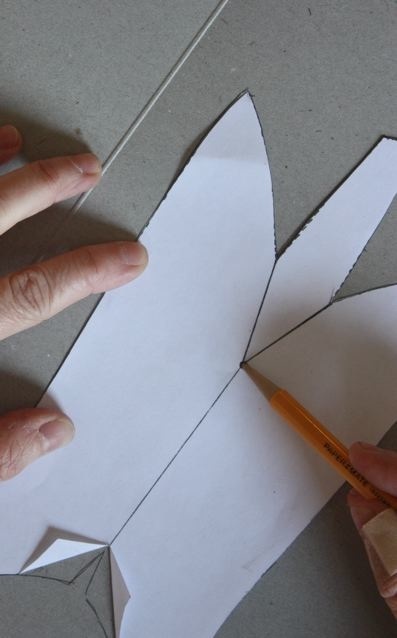 Download the pattern here and cut it out on the dotted line – the solid lines are for scoring – there are little triangles on one end – you can fold those back to trace the line onto your cardboard and poke your pencil through the tip of the V on the pattern to mark your cardboard. 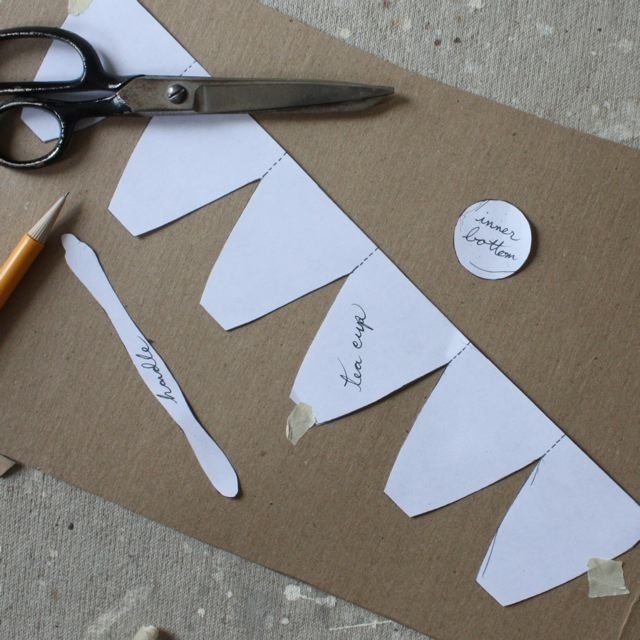 DIY gift tags! Bundled up little birds – you can click here to download. (I added some glitter to his acorn cap after I cut them out). The fleet here is growing rapidly. 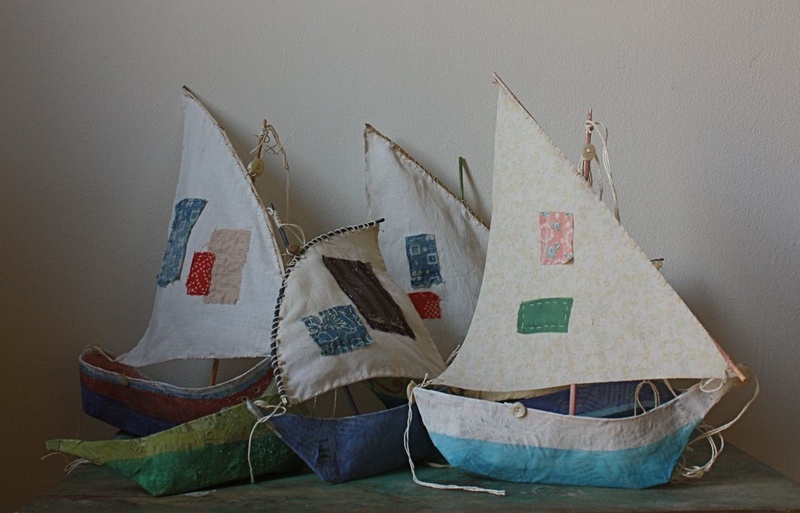 I’m working on all sorts of new boats and ships and the little lateen rigged sailboats inspired by van gogh’s fishing boats are for you to make, I’m going to share the pattern and instructions next week. It takes me forever to work out the “how to” stuff but I think it’s pretty much there and I just need to test it on a couple people and photograph the steps. 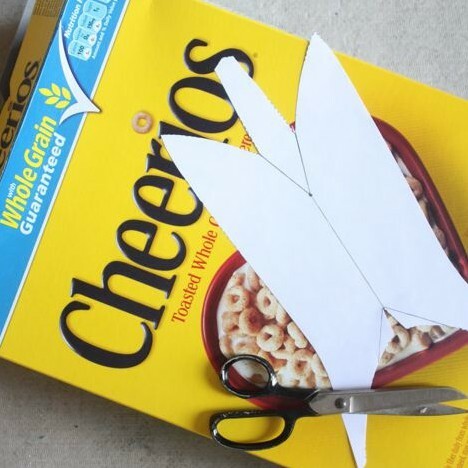 They are simple and relatively quick, I think you’re going to have fun making them. Cardbaord Castle #2 is in the current issue of Elle Decor – Japanese edition. 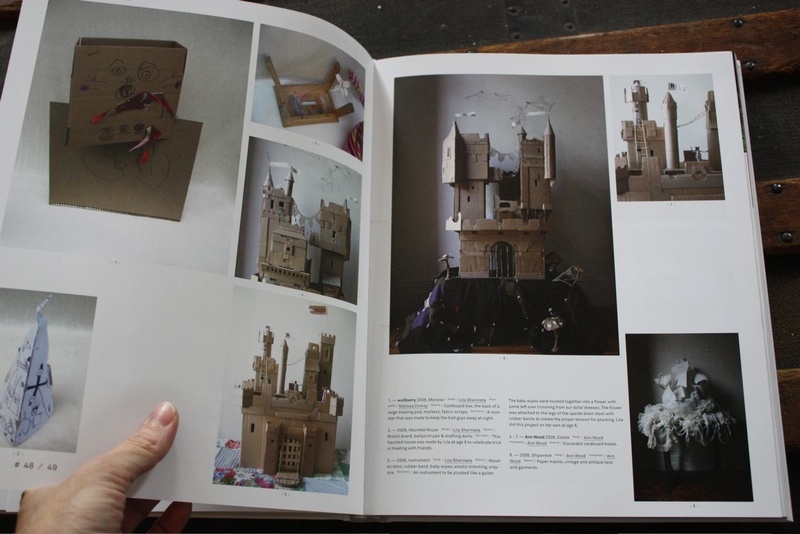 I get excited about any celebration of cardboard castle making and the entire magazine is lovely so I’m pleased and flattered to be included. 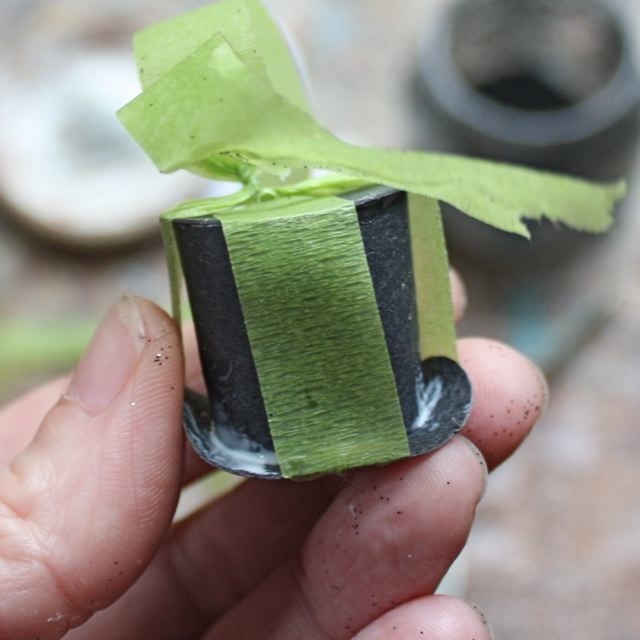 How to make a tiny tophat (in excruciating detail). What you will need: top hat pattern (click to download pdf), black poster board, scissors, manicure scissors ( for trimming the little curved bits), elmer’s glue, floral tape, large paper clips, a light color pencil, a dowel or something for curling the poster board and black glitter. Trace the 3 pattern pieces onto the black poster board and cut them out. 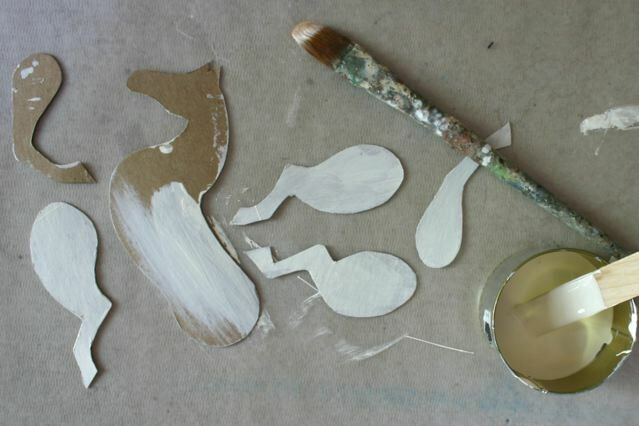 I use a large paintbrush handle to curl all the pieces a little as shown below. 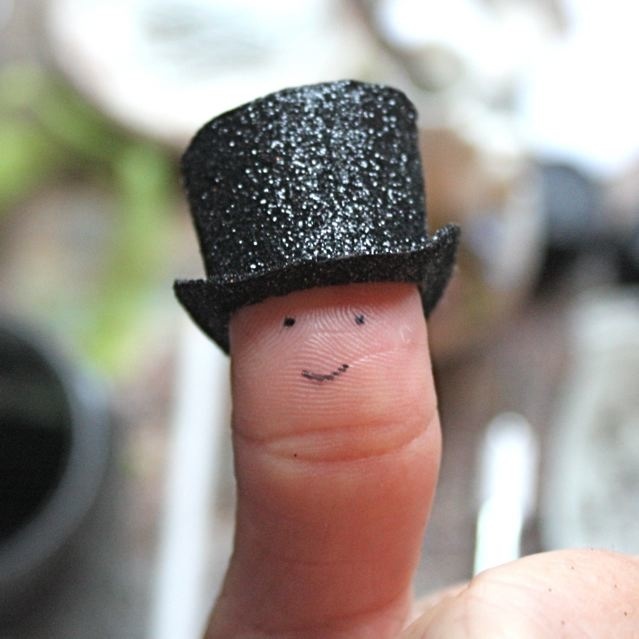 I feel this step is key to your success as a tiny tophat maker. 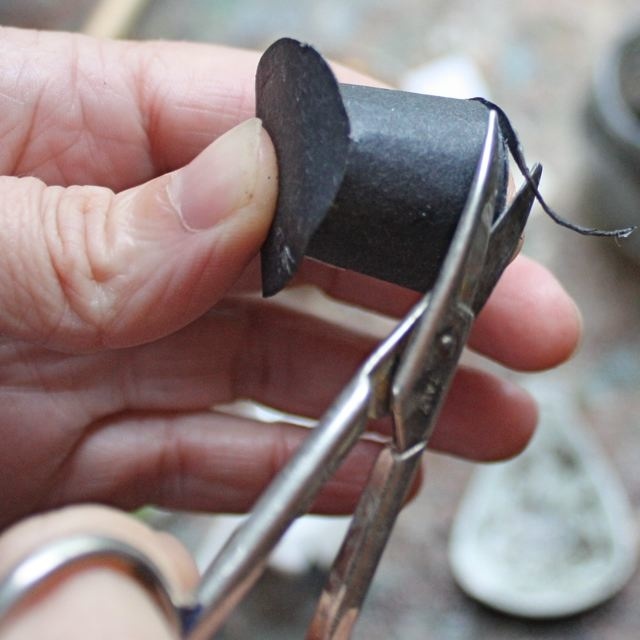 Next, overlap the edges of the cylinder about a 1/4″, glue, and clamp with a paperclip. When the cylinder is dry trim off any extra bits you might have so the bottom and top edges are pretty smooth, apply glue liberally to the top and bottom edges and place the brim and top. I use floral tape to hold it all together while it dries. 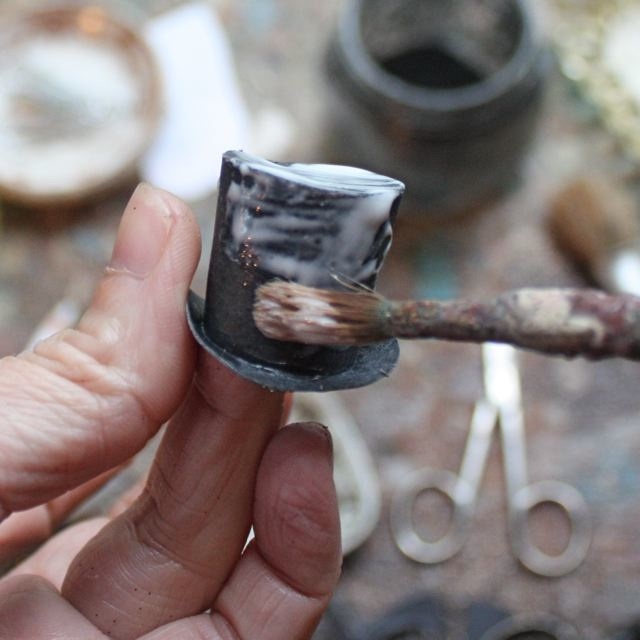 When the glue has dried trim off any excess on the top and brim and shape and smooth the brim with your fingers. 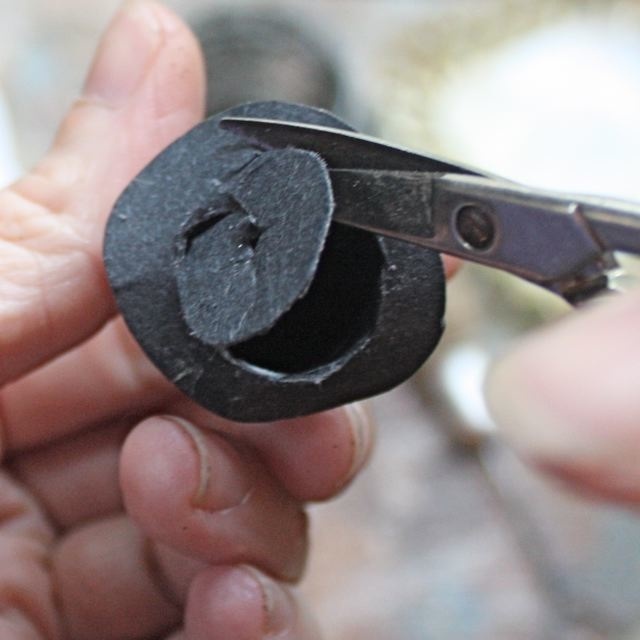 Use the exacto knife to poke a hole in the bottom and then insert the little scissors to cut the opening. Paint it quickly and completely with elmer’s glue, give it a roll or shake in the glitter, leave it to dry and brush off the excess glitter with a stiff paint brush or old toothbrush. Finished! I’m pleased and excited to be included in “Play All Day – Design For Children” published this year by Gestalten. I’m also pleased to live in a world where you can have a blast making castles out of old cardboard boxes and on top of that! somebody will publish them in a lovely book. It’s available at amazon now – check out pages 48 and 49! 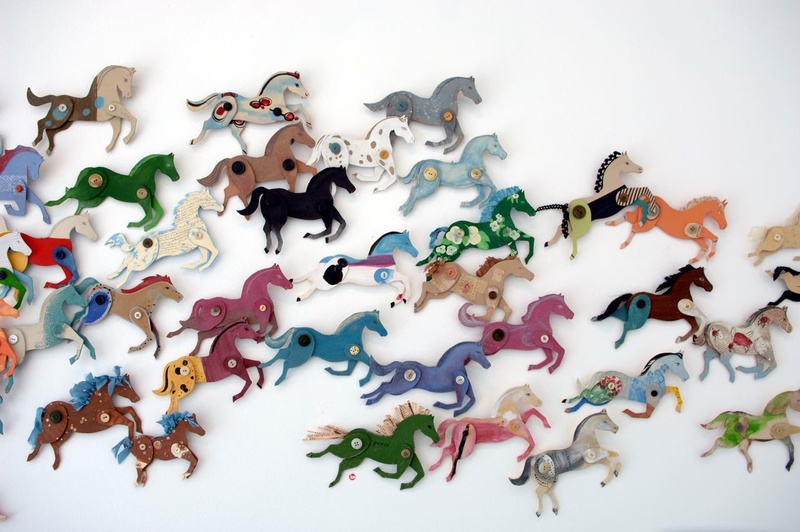 * Fill in the Blank Gallery is having a cardboard horse making workshop on Sunday, if you’re in Chicago check it out – all ages and skill levels are welcome and it’s free!! * Henchard and some other new things ( including some ready made sweethearts and a new set available to order) will be in the shop sometime next week. If you are on the mailing list you will be notified when the shop is updated. Or: How to make a cardboard horse. In 2006 I started making cardboard horses. They were a self imposed assignment, a daily creative task intended to motivate and loosen me up, little experiments, paralysis prevention. My plan was to make a cardboard horse everyday, Monday through Friday until I had 100. I did and exhibited the group at Tinlarkin Los Angeles in 2007. I’ve made 3 patterns, two adults and a colt, to share and I hope you make a cardboard horse or two or three or maybe a little family or maybe your own stampede! 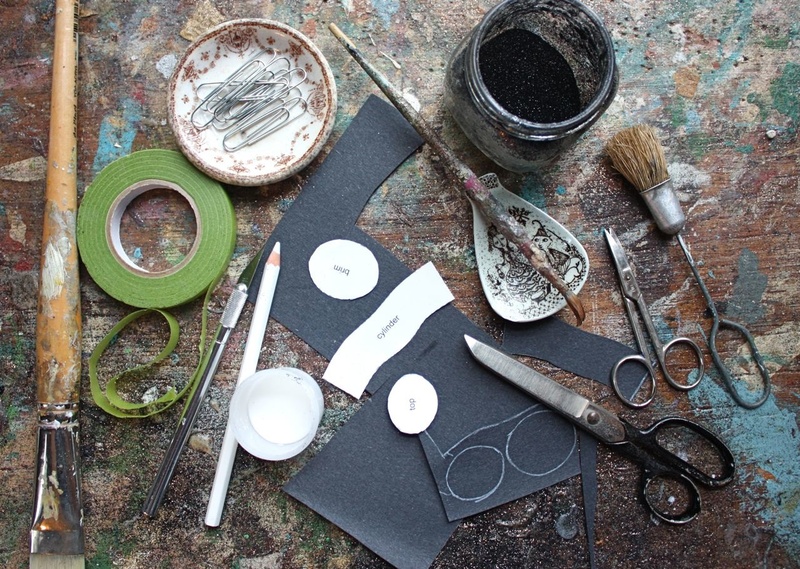 cardboard- you can use any kind – I think a medium weight is good, I’m using cardboard from a gift box. 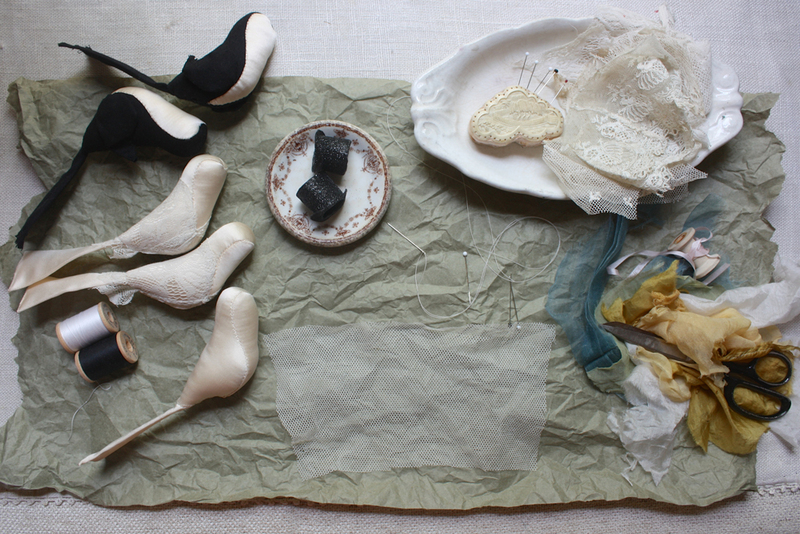 paint and brushes, glue, paper, fabric, lace etc. – whatever you like, whatever you’ve got. 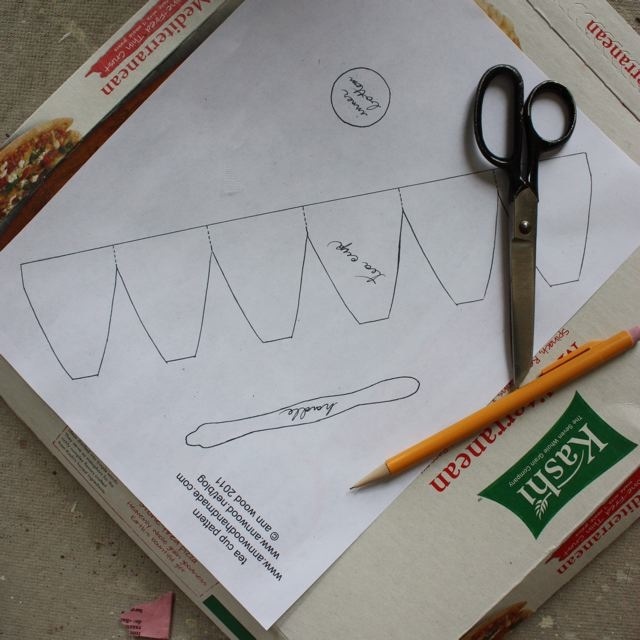 First download and print the patterns, cut out the pieces and trace them onto your cardboard. 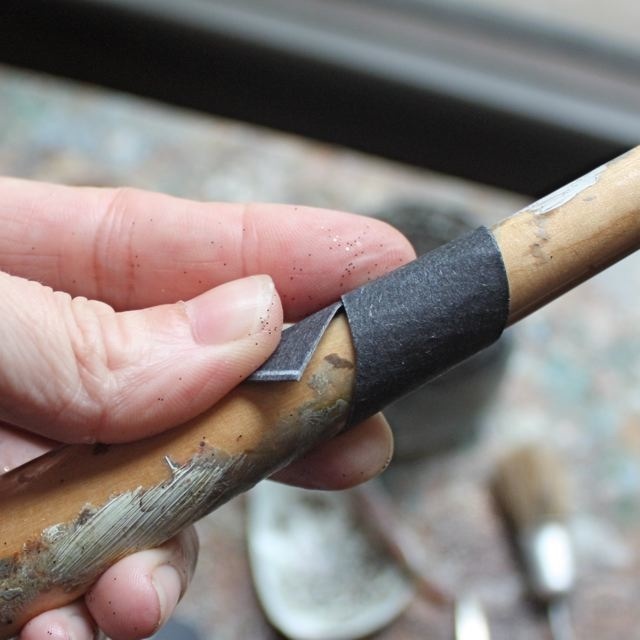 I like to use a pair of manicure scissors for the difficult small bits – corners etc. I included an optional tail and mane in the pattern. 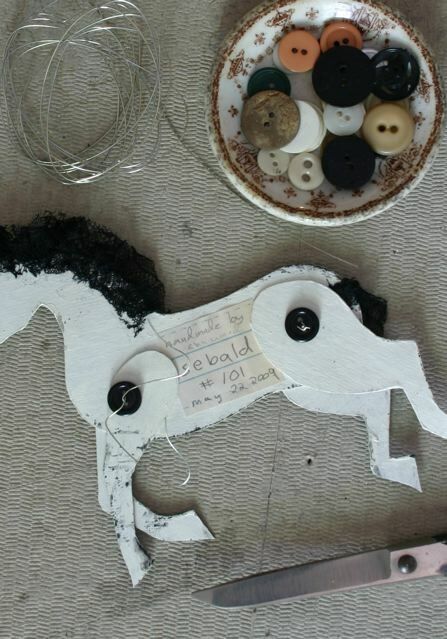 I’m foregoing those for this horse and will add a tail and mane of antique lace. 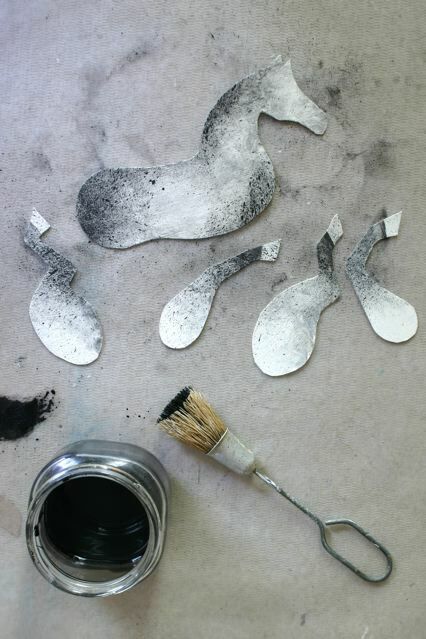 You can finish your horse with collage or fabric or pencil – the possibilities are endless – but if you choose to paint then paint both sides to prevent curling. I’m using latex paint for the base, adding some dapples from my water color box and some splatters of ink, you can use a stiff paint brush or old tooth brush. I used a fine sharpie pen to draw on a very simple eye and mouth. 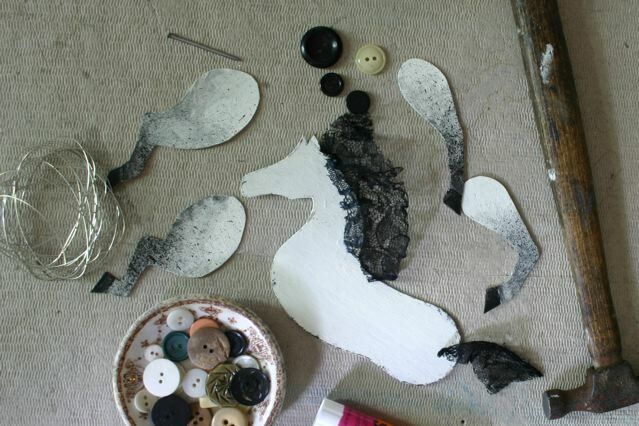 Next I’m adding the antique lace mane and tail using a glue stick ( or elmer’s glue if you prefer). Once that is dry we’re ready to assemble. Arrange the legs with the body sandwiched between and use the nail to make a hole through all three layers. You’ll need to put a piece of wood or heavy cardboard underneath to protect the surface you’re working on. 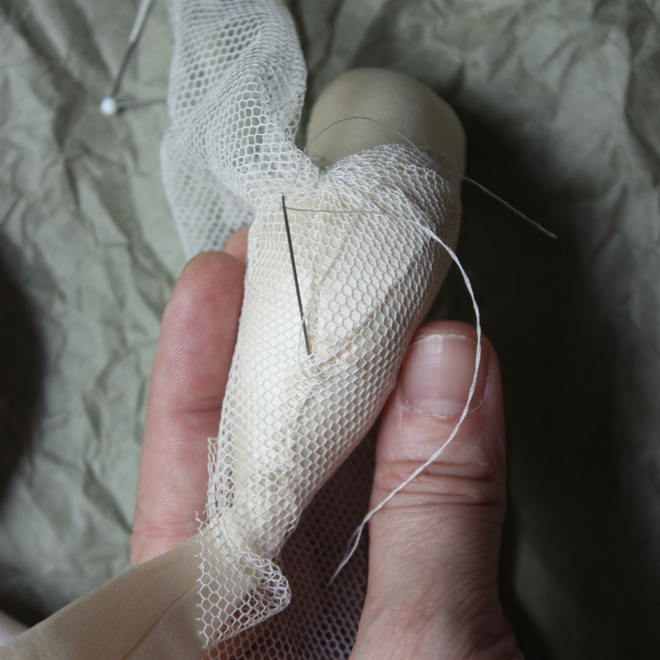 Thread the wire through the button holes and then pass both strands through the legs and body. Thread both wires through a small button on the back, pull it tight and twist to secure and trim the extra wire with pliers. Add another piece of wire for hanging by twisting it around the buttons. I like to give all my horses a name, this is Sebald, horse #101. 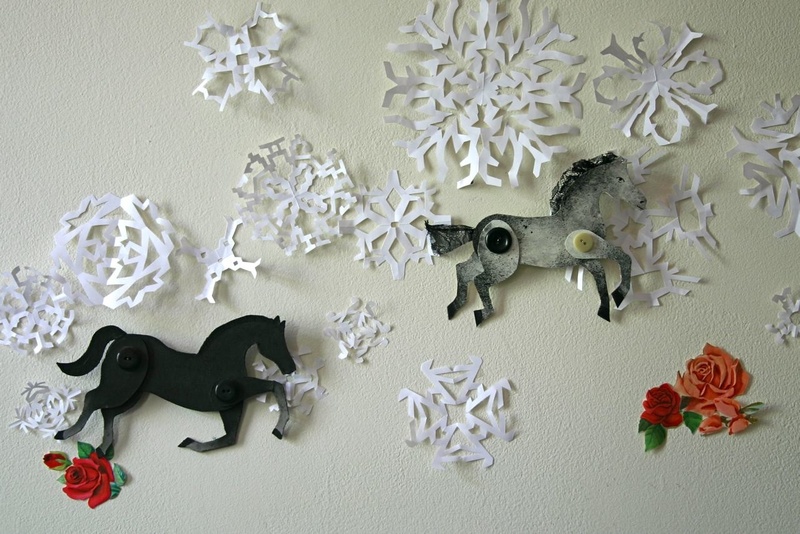 I’ve hung sebald amongst the snowflakes with horse #71 winston.